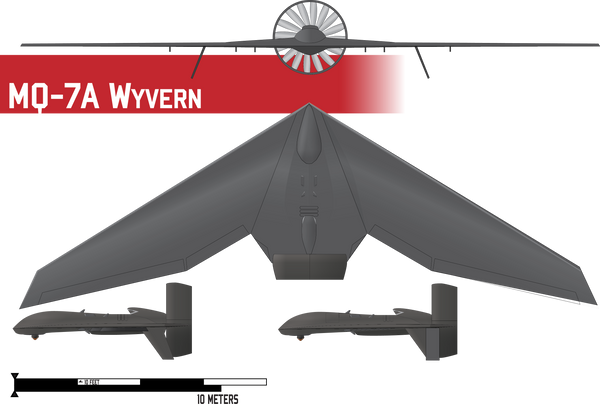 The Wyvern was designed to be a multi-role UAV. It is capable of high endurance missions as well as stealthy reconnaissance, all while being a far more expendable system than conventional manned reconnaissance aircraft. The WARAMS ("Warams") system utilizes hundreds of small cameras each fixed upon a certain spot relative to the aircraft which are aimed by the overall rotation ball upon which they are fixed. The result is a wide-area panoramic view of an area 40mi square with extreme clarity. The operators of the UAV can selectively zoom in on a target, identifying objects only 4 inches in width, with a centerline high-definition camera able to run facial recognition software. With this, the operators may locate targets while still maintaining an overall view of the battlefield to resist focusing too much on one target. Overall, this prevents civilian casualties, aids troop coordination, and keeps full battlefield clarity. Multiple operators may select different views to zoom in on at the same time. The Wyvern was intended originally to be a stealth UAV, but while producing a jet-engine powered model, it became readily apparent that a similarly sized propeller-driven model was needed as well, and it would serve in more capacities than a jet-engine model, so the Wyvern model was prioritized. It still maintains some degree of stealth thanks to it's lift-producing shrouded propeller and angled stabilizers beneath the wing helping to shield incoming radar signals from intersecting with the propeller blade. Unlike other aircraft of it's style, the Wyvern was always intended to be able to mount weaponry in addition to it's reconnaissance roles, and as such all models are able to attach wing pylons to hold bombs and ground attack missiles, allowing it to be able to support troops on the ground or perform more "assassination" style missions, as the Wyvern can loiter above a target for a considerable period of time, just out of side at high altitudes where it is unable to be seen by the human eye, but where the Wyvern can map out an simultaneously view an entire city. Last edited by Pharthan on Sun Apr 19, 2015 7:32 pm, edited 4 times in total.